The game content described below is still in development. This information pertains to features not yet included in the game, and is subject to change. They may or may not end up in a future Terraria release. Note: This article is about future Desktop version updates. For past updates, see Desktop Version history, Console Version history, Mobile Version history, and 3DS Version history. 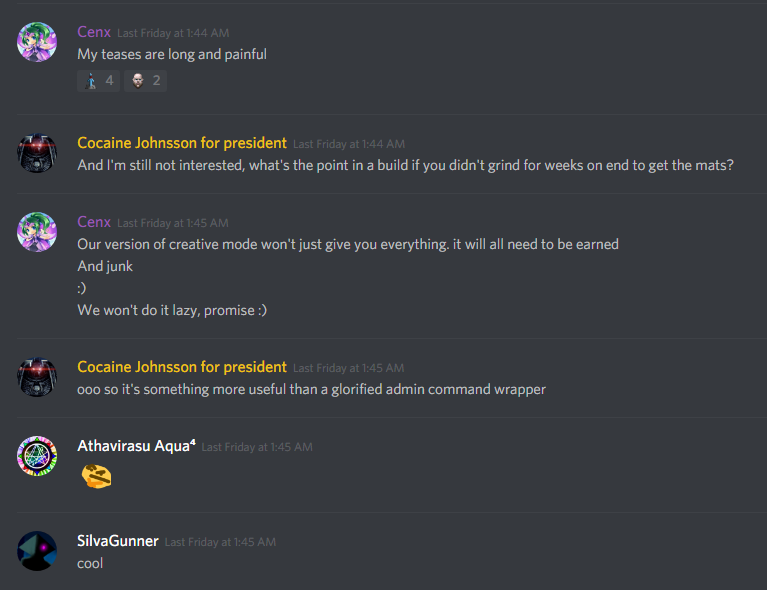 Re-Logic staff members occasionally announce and/or hint at various details of Terraria updates that are still in development. This page lists those details. 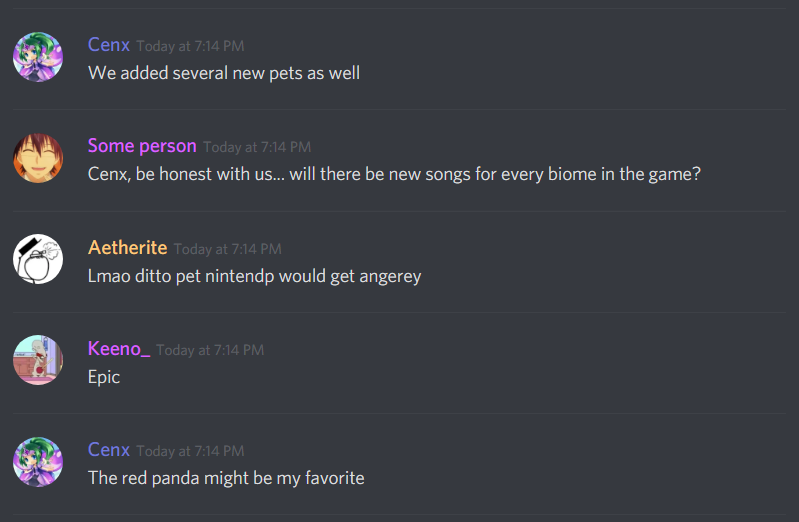 Since the updates described here have not been released yet, and many of these details are only conjectured based on comments or screenshots provided by the staff, all items here may be subject to change, or may not end up in a future Terraria update at all. 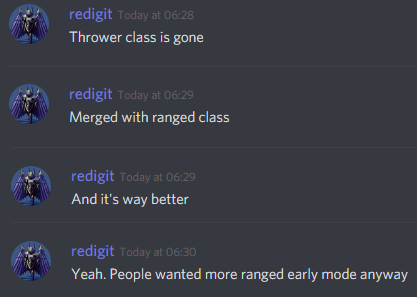 Any and all upcoming features must be sourced to a Re-Logic staff posting. Unsourced information, or information purportedly leaked from other sources, will be removed. Future features and changes should remain confined to this page, and to articles dedicated solely to future items. They should not be added to articles on current features. Graphics officially released by Re-Logic staff, or images cut from them, can be uploaded. Unreleased graphics purportedly leaked from other sources may be Re-Logic intellectual property, and/or may be unreliable, and will be deleted. Original player artwork depicting future items will also be deleted, unless it is solely for personal use in User: space. A new Crimson-themed splash screen. The Windy Day spoiler, posted on July 31, 2018. The Town Night spoiler, posted on October 1, 2018. The Void Vault is a 3×2 storage furniture item which can be placed. The Void Bag is similar to the Money Trough in that it summons a floating storage. It grants access to the Void Vault. If the player's inventory is full, any items that could normally not be picked up will automatically move into the Void Vault storage. This is indicated by a purple pickup text and is only possible while carrying a Void Bag. Mime Masks are now a proper vanity item. Adjusted all pending sell value issues. Can no longer spawn a second Eater of Worlds/Brain of Cthulhu by smashing more Shadow Orbs/Crimson Hearts, respectively. Cactus/Pumpkin/Shadewood/Ebonwood/Pearlwood/Rich Mahogany Bathtub, Piano, Bookcase, and Grandfather Clock all require Sawmill to craft now. Nymph now drops money correctly. Falling blocks will now turn into items if they don't fall correctly. Fixed a crash when attempting to join a dedicated server. Meteors will never land on the Dungeon. Stake Launcher now works correctly with Archery Potions and quivers. Town NPCs that fall off the map will die. Players must be within 300 tiles of the broken Larva for the Queen Bee to spawn. Players who are invisible/stealthed no longer have mouseover text or health bars. The keyboard will glow according to the biome the player is in, and control keys will be highlighted. Note the mannequin near the center of the house. Some resprites of old foods along with some new ones. A teaser of new animations for trees and plants. An additional 8 new minimap borders to choose from. A demonstration of the Celebration Mk. II during a Solar Eclipse. A player causing items to fly upwards upon approaching them. A preview of the resprited Cowboy set. New Blood Moon enemy (image name is goblinshark). New background and floating balloons. Animation of picking up items into the Void Vault. Accessing the Void Vault using the Void Bag. Something being tossed in water. Glowing Bat minions following the player. 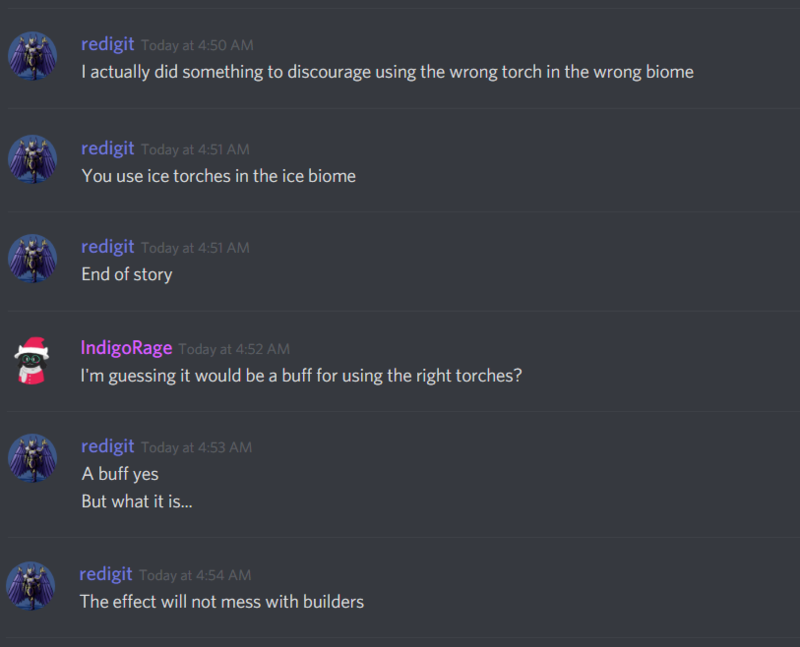 Following the release of the Terraria 1.3 update, lead developer Redigit has moved on to working on another project, though developers Yoraiz0r and Skiphs plan to continue updating Terraria into the future. 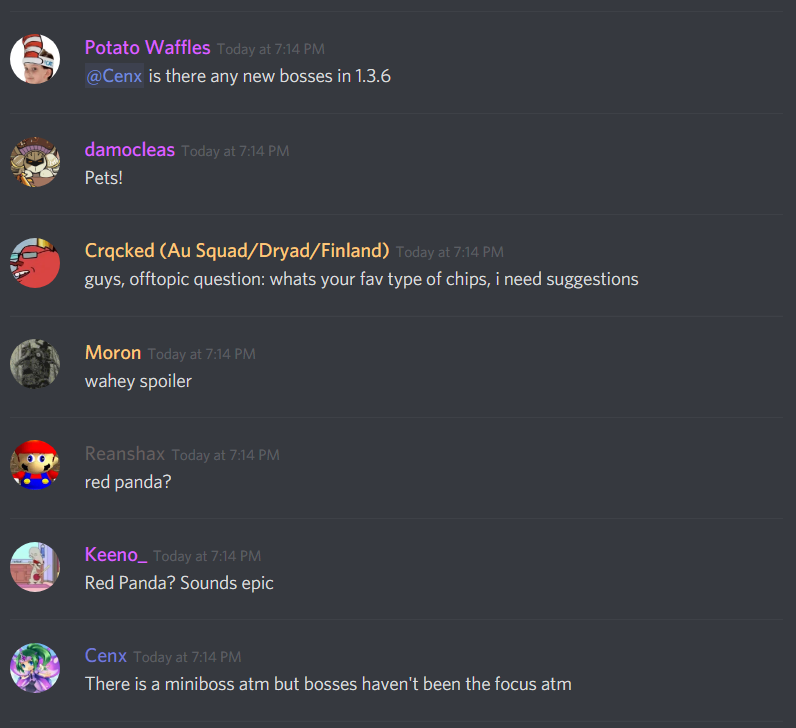 While Redigit worked with the team to develop 1.3.5, it is unknown if he will continue developing updates after this. Redigit stated that he plans to later release Terraria 2, a separate game from the canceled Terraria: Otherworld, although little information is known about the nature or content in the upcoming sequel. This page was last edited on 23 April 2019, at 21:36.